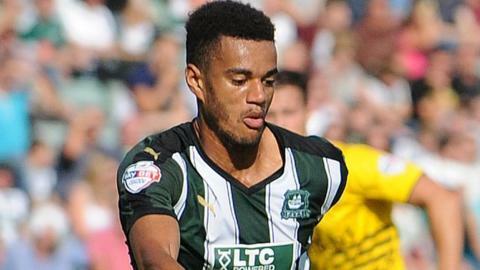 Curtis Nelson snatched a late equaliser to help League Two leaders Plymouth draw with Leyton Orient. The Argyle captain pounced from close range at a free-kick after O's keeper Alex Cisak blocked Luke Croll's shot. Jay Simpson had given the visitors a fourth minute lead as he scored his 14th goal of the season from 18 yards. Jake Jervis and substitute Josh Simpson missed earlier chances to level but John Marquis was twice denied by Argyle goalkeeper Christian Walton. Sammy Moore also fired a free-kick just over the Plymouth bar and Marquis missed another late chance as Orient finished strongly. The only sour note for the visitors was the sight of top-scorer Simpson hobbling off just before half-time. The result means that Plymouth, who lost at home to Devon rivals Exeter on Saturday, maintains their two-point lead at the top of the table while Orient moved up a place to sixth. Match ends, Plymouth Argyle 1, Leyton Orient 1. Second Half ends, Plymouth Argyle 1, Leyton Orient 1. Substitution, Leyton Orient. Scott Kashket replaces Lloyd James because of an injury. Attempt missed. John Marquis (Leyton Orient) right footed shot from outside the box misses to the right. Attempt missed. John Marquis (Leyton Orient) header from the centre of the box is close, but misses to the left following a set piece situation. Frazer Shaw (Leyton Orient) wins a free kick on the left wing. Attempt saved. John Marquis (Leyton Orient) right footed shot from outside the box is saved in the top centre of the goal. Attempt blocked. Craig Tanner (Plymouth Argyle) right footed shot from the centre of the box is blocked. Sean Clohessy (Leyton Orient) wins a free kick in the defensive half. Goal! Plymouth Argyle 1, Leyton Orient 1. Curtis Nelson (Plymouth Argyle) right footed shot from the centre of the box to the bottom left corner following a set piece situation. Attempt saved. Luke Croll (Plymouth Argyle) right footed shot from the centre of the box is saved in the bottom right corner. Foul by Jack Payne (Leyton Orient). Attempt missed. Sammy Moore (Leyton Orient) right footed shot from outside the box is too high from a direct free kick. Foul by Luke Croll (Plymouth Argyle). Ollie Palmer (Leyton Orient) wins a free kick in the defensive half. Attempt blocked. John Marquis (Leyton Orient) right footed shot from the centre of the box is blocked. Attempt missed. John Marquis (Leyton Orient) left footed shot from outside the box misses to the left following a set piece situation. Carl McHugh (Plymouth Argyle) is shown the yellow card for a bad foul. John Marquis (Leyton Orient) wins a free kick in the defensive half. Attempt missed. Jean-Yves Mvoto (Leyton Orient) header from the centre of the box is too high following a corner. Corner, Leyton Orient. Conceded by Curtis Nelson. Attempt saved. Bradley Pritchard (Leyton Orient) right footed shot from the left side of the six yard box is saved in the bottom right corner. Attempt saved. John Marquis (Leyton Orient) right footed shot from the centre of the box is saved in the bottom right corner. Corner, Plymouth Argyle. Conceded by Jean-Yves Mvoto. Corner, Plymouth Argyle. Conceded by Sean Clohessy. Attempt saved. Jack Payne (Leyton Orient) right footed shot from outside the box is saved in the centre of the goal. Attempt missed. Sammy Moore (Leyton Orient) right footed shot from the centre of the box is too high. Foul by Josh Simpson (Plymouth Argyle).